O beloved people if you want sukh - eternal happiness and sohilarra - eternal bliss har dhiaavahu - meditate upon Hari, meditate upon Waheguru and in this way you will obtain both of these treasures. Maharaj jee says become a gurmukh, follow the guru, listen to what the guru says, do what the guru says forever and ever. Never turn away from the guru and then you will paavahu - obtain the fal. What is the fruit of this labour? 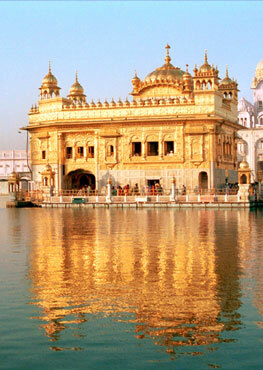 You will obtain Waheguru, you will obtain union with the lord. O beloved beings if you dhiaavahu - if you meditate upon the Hari name - the name of Akaal purakh, Hari - the nourisher of whole world, the protector of the whole world. If you meditate upon wahegurujee's naam then you will fal paavahu - obtain the fruit of union with the lord. If as a gurmukh, as a follower of the guru you listen to what the guru says and you meditate upon the naam you will obtain union with the lord and through this union janam janam kae dhookh nivaarae - many pains of your janam janam - of your many countless lifetimes will be nivaarae - will be erased, will be alleviated. Maharaj sahib Guru Amardaasjee is saying balihaaree - bal meaning power, my own strength and haaree means to give up. I've given up all of my own strength, my own clever devices, all of my own thoughts. Sathguru Patshahjee says I have sacrificed all of my own gur apanae vittahu - to my Guru jin kaaraj sabh savaarae - who has resolved this affair of the human life. Guru Arjan Devjee Maharaj tells us: gobindh milan kee eih thaeree bareeaa - this is the time to meet the lord. Guru Amardaasjee Maharaj says that I am a sacrifice to Guru Angad Devjee maharaj who has blessed me in this life and merged me in with Akaal Purakh. Sathguru Patshahjee says, O jan, who humble servants of Hari, of Waheguru if you want to obtain the fal - the fruit of sukh - of eternal peace then har jaapo - meditate upon Hari and then what will happen? Har prabh kirapaa karae - that Waheguru jee, that lord, that Waheguru will bestow His glance of kirapaa, His glance of grace, His glance of mercy upon you. Meditate upon the lord and the lord in His mercy will bless you with eternal sukh, with eternal peace. Sathguru patshahjee says, sunahu jan bhaaee - listen O humble servants, O brothers and sisters listen to this sukh sohilarra har dhiaavahu - if you want sukh, eternal happiness and eternal bliss then meditate upon that Hari who is protector, who is cherisher, who is the nourisher of whole world. Maharaj jee says those gurmukh pyaare who have sun - who have listened to the gun - to the praises, to the virtues of Hari, of Waheguru they have been bheenae - they are completely imbued in these virtues, they are completely drenched in these praises. Once being drenched in these praises what has happened? They have gone into sheaj subhaaeae - the state of sehaj - the state of complete balance where whatever comes, neither pain or happiness moves them. In this state of sehaj, through the guru's instruction, through the guru's math - wisdom they naam dhiaaeae - they meditate upon the Naam. Maharaj jee says those people who have it written in their pre-ordained fortunes thin gur miliaa - they've been united with the Guru, they've met the true Guru Siri Guru Nanak Devjee Maharaj, Siri Guru Granth Sahib jee Maharaj. Thin janam maran bho bhaagaa - from their lives the bho, the fear of janam maran has left. They do not have to fear coming back into reincarnation again and again. From within them, inside duramath - all evil-mindedness, all of those thoughts which lead them away from Waheguru and dhoojee - the love of duality, the love of maya, the love of purely selfishness and material goods has been khooee - has been removed. So jan har liv laagaa - that humble being has attached himself, his consciousness to Hari, to Waheguru. Maharaj sahibjee, Sathguru Amardaasjee Maharaj is saying those pyaaree - those beloved beings who have been blessed with kirpaa, with grace by my beloved lord thin anadhin har gun gaaeae - day and night they sing the praises the Hari, of Waheguru. By listening to the glorious praises of the lord, O my mind, drench yourself and listen to these glorious praises and listen sehaj subhaaeae - then you too will attain the state of complete poise and balance, the state of complete peace. In this age of Kalyug, this age of darkness raam naam nisathaaraa - the only way of being saved is through the name of raam - through the name of the lord. Sathguru maharaj sahibjee says on Ang 1138 of SGGSjee Maharaj: kalijug mehi eik naam oudhaar - you can only be saved in this dark age through the name of the lord. Sathguru Amardaasjee Maharaj is telling us that same thing today in this shabad. If we ask Maharaj sahib, Maharaj where are we going to get this naam from? Maharaj says that the veechaaraa - the understanding of the shabad, of naam, of gurbani is found from the guru. No other place can this be found but from the guru. Those people who have been blessed with grace, with kirpa - grace of the lord they find - they paaeae gur sabadh veechaaraa - understanding of the guru's shabad, they are blessed with updesh, with message from the guru, with the math of the guru, with the instruction of the guru and through this raam naam piaraa - through their meditation they develop a taste, a love, a affinity for the name of the lord. They say than raam naam piaaraa - the only thing that is beloved to me now is the name of the lord. Bhai Sahib Bhai Veer Singh jee says in their words, in their literature that if we say Waheguru once and we feel like saying it Waheguru again we have love inside us to say Waheguru again. If we read one Japjee sahib da paath and we feel like reading another, if we read one sukhmani sahib and feel like reading another then understand that we have excelled in our spiritual practice. That is excelling in the practice of spirituality. If we take god's name once and we feel like saying it again that means we are doing something right, that means we are on the right path. Maharaj is talking about this avasthaa - this state of being that in that state of being sehaj - it is not forced at that point, at that point naturally gun gavaai - we sing the praises because they seem piaaraa - because they seem beloved to us. Dhin raathee - throughout the day those beloved piaarey sing the praises and even whilst sleeping those gurmukh piaare meditate, Waheguru Waheguru in their sleep, all night they are meditating upon the lord. There are stories of Sant Gurbachan Singh Jee that in their youth when they use to do Akand Paath sahib, they use to come off the raul seva - their duty in the Akhand Paath - the sings who were around them heard them reading the same lines of bani which the paathi singh was reading on Siri Guru Granth Sahibjee's tabiaa - on the throne of Siri Guru Granth sahibjee. They were that attuned to Akhand Path sahib that even at night they were reading all of the raags, all of the shabads, all of the musical measures. Kilavikh sabh gavaaeae - in this state Maharaj jee says that all of their past sins are eradicated and in this state of spiritual bliss what do they say? They say Waheguru jee everything belongs to You and You belong to all. Ho thaeraa - I am Your's, O Waheguru jee and thoo hamaaraa - You are my lord, my suaamee, my master. They have realized that in this age raam naam nisathaaraa - the only way to be saved is through the name of the lord. That all of the desires are thriapth - are satiated, are filled. In this state where virtues are filling up within har gun gaae - the beloved beings sing the gun - the praises of Hari, of Waheguru. sadhaa thripthaasee - forever and ever all of their thirst, all of their hunger is taken away, is eradicated. Fir bhookh n laagai aaeae - then again they never feel any hunger, they go beyond all hunger; physical, mental and spiritual. That jan, that being, that servant of Waheguru who dhiaaeae - who meditates upon the name of Hari, of Waheguru. that servant of the lord who meditates upon the lords name, dheh dhis - in all ten directions, the ten directions being north, north-east, east, south-east, south, sout-west, west, north-west, up and down - in all these ten directions they are pooj - they are worshipped. There is a small story which comes to mind with this tuk. Bhagat Ravidaas jee was from the shoe-maker caste and because of this many of the high caste brahaman priests used to look down upon him and used to say don't go that bhagat Ravidaas he is from the low caste, we cannot eat with him, we cannot sit with him. One day the rani, the queen of Jathour came to do darshan - to see Bhagat Ravidaas jee and she asked Bhagat Ravidaas jee to bless her with the name of lord and Bhagat Ravidaasjee blessed her and told her how to meditate upon the lord and every day she would meditate upon the lord. Her mind became still, she got peace within because she was blessed with the sangat, with the company of a true saint - Bhagat Ravidaas. What happened was that the high cast priest went and told the king that look what your queen is doing! She is going to a low caste and disgracing us all! The king talked to his queen and said look you've upset all of these high castes what are you going to do about it? Queen said let me talk to them. When the queen went and talked to them she said to the high caste priests that all you want is money, all you want is for me to worship you. I'll give you money, I'll give you what you want. Come to the palace and I'll arrange to feed you all, to do what was called a bhandaraa - where they would feed the high caste priests. The queen organized the bhandaraa but she also went bare foot, humbly to ask Bhagat Ravidaas jee to come. Bhagat Ravidaasjee first said no that when I go there I will cause anger and hatred by just being there, to the high castes. Rani said, no Bhagat jee you are my guru, my spiritual guide, you are my teacher if you don't go I am not going to do it. Eventually Bhagat Ravidaasjee agreed and said that they would turn up. When the bhandaraa day came all of the high caste priests got together and they were about to eat when bhagat Ravidaasjee walked in. When they saw Bhagat Ravidaasjee they said we are no going to sit on the same level as the shoe-maker. We are not going to eat the same food as a shoe-maker and they all started creating a fuss. The king came and said to Bhagat Ravidaasjee, Bhagatjee please come and sit in this separated room. Bhagatjee went and started doing simran - meditation in that separate room and all of the brahamans said, right now we will eat. When they all sat down to eat and when they were about to eat their food, each of the brahamans - there were big lines, hundreds of them in each line, when they went to eat their food each one of them could see Bhagat Ravidaas jee sitting next to them, each one of them could see a separate version and none of them spoke. None of them spoke and none of them wanted to eat because they could all see him sitting there. As many brahamans there were as many of them could see bhagat Ravidaasjee sitting next to them. When they weren't eating the king said, what is going on? All of the brahamans said that we can all see Bhagat Ravidaas sitting next to us. The king laughed and said but Bhagat Ravidaas jee is in the next room when they went and did benti to Bhagat Ravidaasjee, Bhagat Ravidaas jee at that point sang this shabad which is found on Ang 1106 of SGGSjee: aisee laal thujh bin koun karai - O Laal, O my beloved lord who could do such a thing apart from You. Gareeb nivaaj guseeaa maeraa - You are the One who looks after the honor my, lord of the world, maathai shathra dharai. Bhagat jee also says in this shabad neecheh ooch karai maeraa gobindh - You are the One who exalts the lowly kaahoo thae n ddarai - You are not afraid of anyone. jaa kee shoth jagath ko laagai- those people who say, O these people are untouchable, the world says that those people are untouchable but thaa par thuhaaee tarai - You grant Your glance of grace even on those people that the world calls untouchables. You even take them into Your embrace, like me. So in that way the high caste Brahamans realized that Bhagat Ravidaasjee was a beloved of the God and they fell at the feet of Bhagatjee. So is this line: Dheh dhis pooj hovai har jan kee jo har har naam dhiaaeae | In all directions all must bow down to the servant of the lord. Sathguru Patshahjee says that Waheguru Himself attaches us to Himself. Waheguru jee attaches us into naam simran, into keertan, into singing the praises and vishorrae - Waheguru jee separates us from kaam, krodh, lobh, moh, ahankaar - from lust, desire, anger, ego, greed, attachment, slander. Waheguru jee separates us from all of these things and attaches us into His seva, into His service. Those Gurmukh pyaare who are attached into the seva, into the selfless service of Waheguru they proclaim loudly that without Waheguru we can see no other. That saajan - that lord, my Waheguru, those Gurmukh pyaare, those blessed souls tell us that Waheguru aae vuthat ghar maahee - Waheguru has come to dwell within the home of my heart. So Gurmukh pyaareyo, beloved saadh sangat jee guru Amardaasjee Maharaj is telling us today the glory of singing the praises of Waheguru and how Waheguru jee can take those who the world thinks is polluted and take them into His embrace through His name, through His naam. Waheguru Jee Ka Khalsa, Waheguru Jee Ki Fateh!